In order to break the monotony of mind-numbing television advertisements and series previews interspersed with trashy television programmes repeated over and over again on Starhub, this household has occasionally turned to the Internet. Hulu is an American subscription-based on-line video streaming service which provides free access to a limited number of TV programmes and videos. I like to watch Jon Stewart’s Daily Show with my morning porridge and Mrs M was partial to the occasional episode of House (which has just ended by the way). Even here, despite claims of ‘limited commercial interruption’, the service is predominantly aimed at brainwashing viewers with the same advertisements over and over and over again, even allowing viewers to select which advertising experience they want to enjoy. A small amount of computer jiggery-pokery is required to access the Hulu outside of the US. 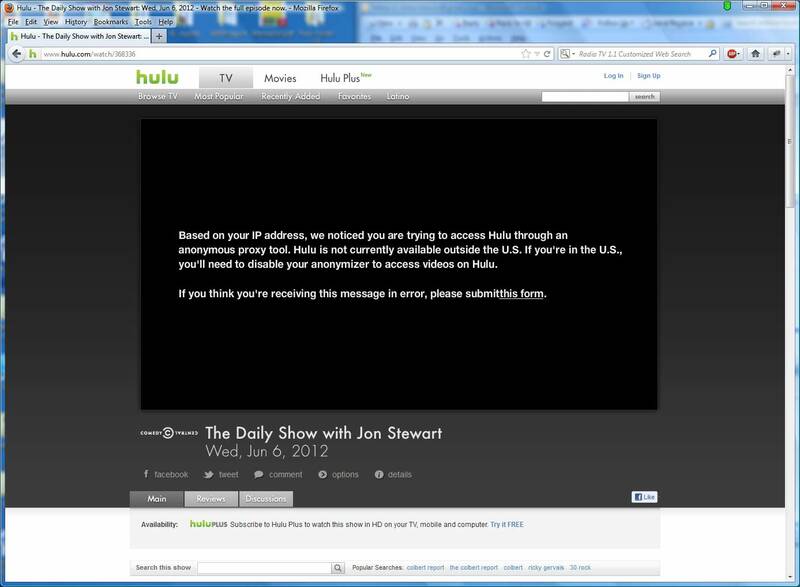 However, it seems that Hulu has taken steps to block this particular avenue of pleasure from our lives. So it’s back to Starhub. My thoughts on ‘Living the Excitement’ with this service have been previously expressed. I hope Mrs M can get the blood stains out of the sofa. [UDATE] Oh joy, the Daily Show website is accessible in Singapore (no jiggery-pokery required)! [ANOTHER UPDATE] The Daily Show is accessible in Singapore but not UK??? 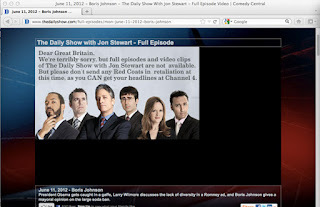 We’re terribly sorry, but full episodes and video clips of The Daily Show with Jon Stewart are not available. But please don’t send any Red Coats in retaliation at this time, as you CAN get your headlines at Channel 4.